Most people list common foods amongst their favorites. My son Josh will take Pizza as his dish of choice and my brother would gladly eat Mayonnaise before anything else. While I like both of those options, I hold one dish above all others: Rose Family Meat Pie. A simple combination of ground beef, ground pork, onion, spices and flaky pie crust. Garnished with just the right amount of ketchup (a sacrilege in my dad's family), it's a delicious treat. Meat pies have been getting a bad rap lately, but if you haven't tried one, you really should (stick to priest though). Unfortunately I have to wait until the holidays every year to enjoy it. My dad (who is carrying the recipe down from his Mom) recently made the switch from large community pies to individual meat pies. Last year he showed me how to make the pies at his house, so this year I decided to try and step up and make some myself. My dad usually makes at least 16 individual pies a year but I wanted to start slow so I cut the recipe in quarters to make 4-5 pies. After buying the ingredients yesterday, I started work this afternoon and simmered the meat and spices for over 3 hours. While the simmering was underway, I set out to make the crust. The recipe calls for the use of a food processor. We do not have a food processor at our house so I tried to improvise by using a blender to combine flour, cold butter, Crisco, eggs and other ingredients. Bad idea. The blades just spun and mixed up the flour only. Lori suggested I go to Giant and buy a pastry tool to mix it by hand. Before resorting to that step, I tried mixing the ingredients in a mixing bowl using a fork. After about a few minutes of old fashioned elbow grease, I actually had a lump of dough. I was surprised that worked so well. Rolling out the dough and making the pie crust and top was nearly a disaster. The dough kept sticking to the rolling pin and the table despite the use of large amounts of flour. Eventually I managed to roll out enough and make two pies. At that point, the dough was so tough to work with and I was getting pretty frustrated. Lori suggested I go outside with the kids and let the dough cool in the fridge. As per usual, she was right. When we came back inside, she was rolling out the dough after it cooled and she was able to put the crust and tops together for the remaining two pies. 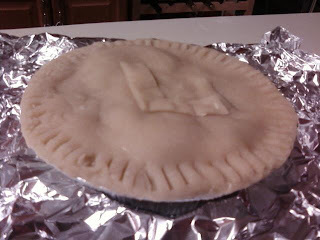 The picture above is the pie she made with an L on it for Lori. I have my own J pie too. Four pies altogether is not too bad. We immediately froze the pies for consumption at a later date (I just had my meat pie fix on New Year's Day at my Dad's). Since we had a little dough and meat left over (not enough for a full pie), Lori made an impromptu Meat Empanada in the toaster oven. It was pretty damn good and I have high hope for the real pies once we do heat them up. I'm sure I'll never be able to top my Dad's pie baking skills (after all, my best kitchen tool in the microwave), but at least this is a good start. Thankfully my resourceful wife was around to finish the deal. Next year I think we'll invest in a food processor to make the crust preparation run a little smoother. If anyone wants the recipe to try to make this themselves, let me know and I'll ask my Dad if I'm allowed to disclose a piece of Rose family tradition. Hey, using the fork as an impromptu pastry blender was also my idea. Also, we used to have a food processor, but it died. I suspect that the crust will be crumbly rather than flaky, based on the fact that it got a little overworked with the rolling pin. The empanada seemed to confirm this suspicion. What is the difference between this and an empanada (besides shape)? Lori, with a new one on the way you might need a new food processor! different spices. Empanada is more spicy. This is not spicy at all. Uses some cloves and summer savory for spicing. The pie looks so good! Yum. I bought a pastry blender this year and it's one of the best kitchen tools I've purchased. My mom always used it to make pie crust, so if you don't mind a little elbow grease, the food processor might not be a necessity (especially because you will need a pretty big one to make any large volume of dough). Meat Pie Update: I just baked two of the frozen pies. One for myself and one for Josh and Alex to split (Lori is all meat pied out for the season). It turned out good but not great. The meat was fantastic but the crust was way buttery and flaky. It easily broke apart and was not as cohesive as my dad's batch. I'm pretty sure it was due to the fork-process of pastry blending. A pretty good meat pie is better than an ordinary dinner though so I enjoyed it. Alex wanted no part of it (he didn't eat my dad's much either). The good news is that Josh LOVED the meat pie and ate some of Alex's portion too. He chomped it down like a champ and maybe he will be the one to carry on the meat pie tradition.